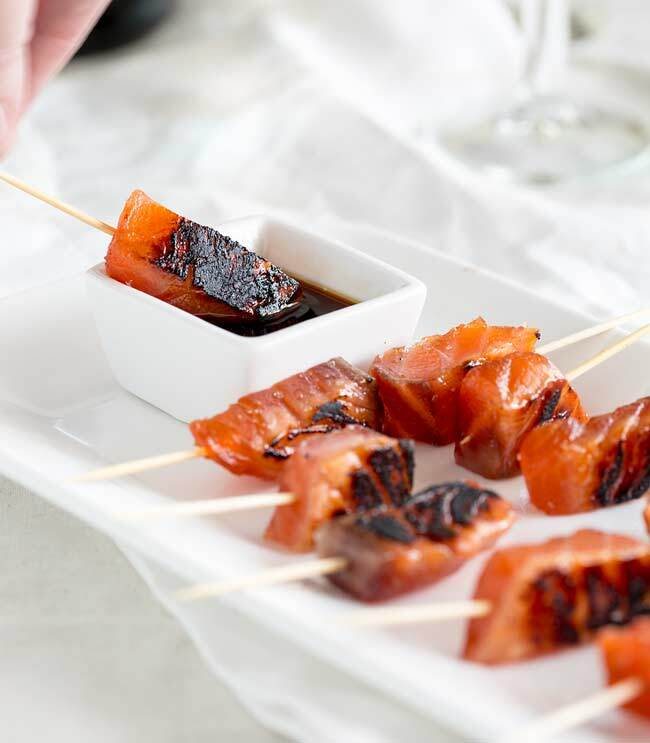 These Cured Brown Sugar Salmon Skewers are an impressive finger food perfect for entertaining. They are so easy to make, plus you have to make them ahead of time, so they are a stress free appetizer idea. The salmon is cured in salt and sugar and then grilled so the salmon is crusty and cooked on one side but tender on the other. 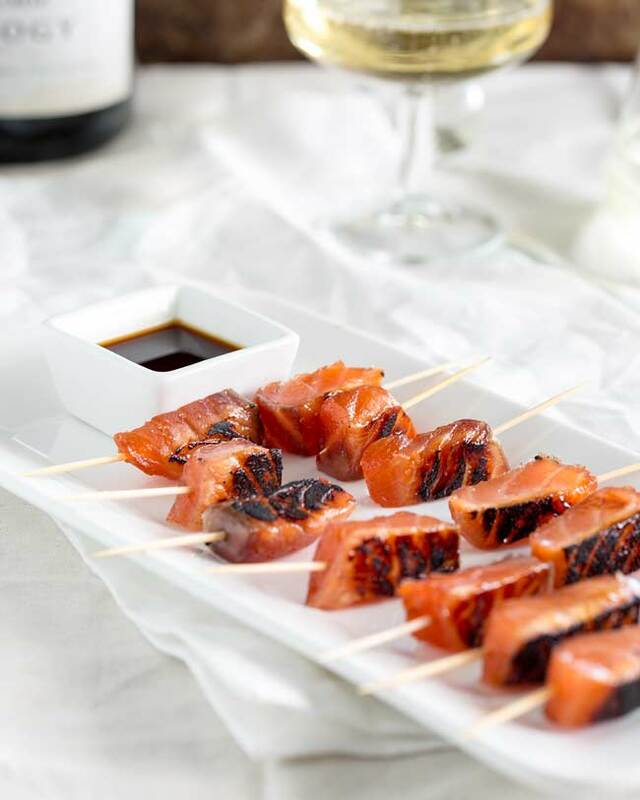 These cured brown sugar salmon skewers are a stunning yet simple appetizer idea. The gorgeous deep orange of the salmon contrasts to the black char, and then the flavour! You will be blown away with the sweet and salty salmon. This is decadent, delicious and dazzling party food! The combination of sweet and salty is nothing new, but it is oh so good that I like to use it whenever I can! Then along with the sweet and salty cure we have the deep smoky char. Oh man, my mouth is watering as I write. I love these!!!! I love this brown sugar salmon served as little skewers, or lollipops as I like to call them when I serve them at parties. Dipped in a little soy sauce they are just crazy good. Perfect with a glass of champers. Pass a platter of these around at your next party and you will be the hostess with the mostess. Just look at that char!!!! 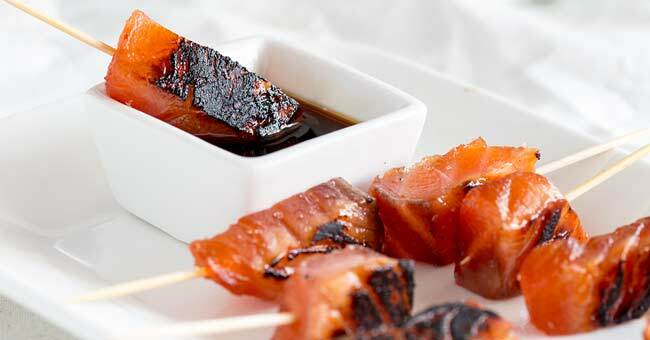 These cured brown sugar salmon skewers have it all! The real key to the flavour of these salmon skewers is the brown sugar. It adds a deep toffee richness to the salmon and then when they are seared it creates the most amazing crust. You don’t want to cook these for long. The fry pan wants to be searingly hot and then they need 30 seconds max to get the deep almost burnt toffee finish. Do them in batches so you can easily remove them from the pan. Plus!!! These skewers don’t need to be served hot from the pan! Once charred, plate them up and refrigerate them until needed. These Brown Sugar Salmon Skewers are always the first thing to go at parties! I find people are intrigued by them and once they have a first they go back for a second. It is the smoky salty sweet combo that people just find addictive! If you love this recipe for Cured Brown Sugar Salmon why not pin it for later. Mix the rock salt, granulated sugar and brown sugar together in a bowl. Place a large pieces of clingfilm on a work surface. Spoon half of the sugar mixture into a salmon shaped mound on the cling film. Place the salmon on the sugar mixture. Top with the remaining sugar mixture. Wrap the clingfilm tightly around the salmon and place in a large (non-metal) dish. After this time turn the salmon over, then replace the board and weights and refrigerate for a further 12 hours. Unwrap salmon, scrape off any sugar mixture. Rinse the salmon well and dry the salmon flesh with paper towel. Cut the salmon into thick fingers and skewer each with a cocktail stick. Place a flat grill pan over a high heat and once it is smoking sear one side of the cured salmon skewers. 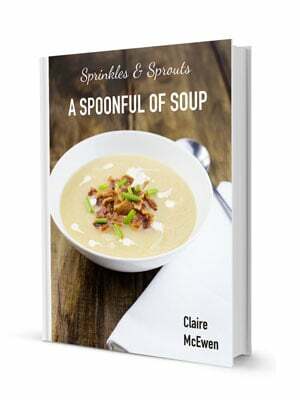 Serve with a soy dipping sauce. Using rock salt ensures your salmon isn't too salty. As you don't eat all of the salt and sugar it is hard to calculate the exact nutrition, so I took the nutritional value from some store bought cured salmon from the sushi section. These delicious brown sugar salmon skewers are an idea from my days in wedding catering. When I worked in the hotel, cured salmon bites served on a small spoon were one of the higher end canapés. But, I never asked for a recipe (no idea why!! ), so through a bit of trial and error I came up with my own cure. The finished salmon is a little firmer than I remember but the flavour is so delicious! And I like the slightly harder cure that my recipe provides. It makes these even more perfect for parties, because now they can be skewered! And anything that can be eaten with off a stick is a winner in my party book. Mr 10 can’t get enough of these, I made this batch as a nibble for our Sunday board game and I am pretty sure he ate over half of them!!!! 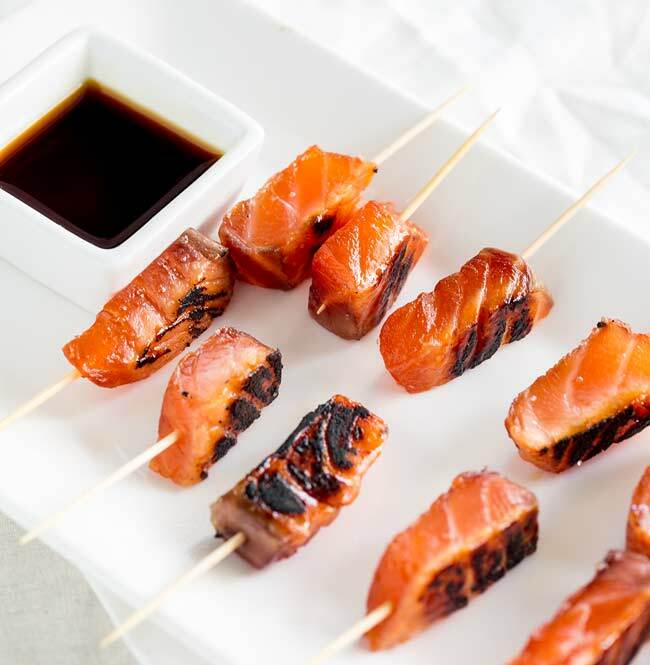 If you are a lover of smoked salmon and gravlax then these brown sugar salmon skewers are going to be your new favourite thing!! Plus if cured salmon is your thing you have to check out my Blueberry, Gin and Dill Cured Salmon, it is just so pretty!!! 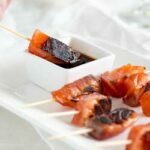 If you love food why not subscribe to my newsletter, I will drop you an email every now and then, just to say hi and send you a couple of recipes think you might love, like these Cured Brown Sugar Salmon Appetizer Bites. Yeeeep, I’m now craving this whole plate and I don’t care it’s not even 7am yet. Holy MOLY!! This salmon is dropdead gorgeous! I LOVE these skewers. Any kind of cured salmon is amazing, but these crisped ones just look awesome. LOVE it! Thank you Danielle, they are always a big hit when I serve them at parties. These will be just perfect for Easter! 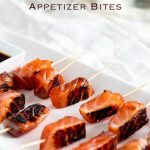 These salmon skewers are so genius for a party!! These are delicious bites! I would be happy to see these at a party!